Google has launched the Knowledge Graph, which it says will help you discover new information quickly and easily, according to the Official Google Blog. Take a query like [taj mahal]. For more than four decades, search has essentially been about matching keywords to queries. To a search engine, the words [taj mahal] have been just that — two words. So Google has been working on an intelligent model — a “graph” — that understands real-world entities and their relationships to one another: things, not text strings. The Knowledge Graph enables you to search for things, people or places that Google knows about — landmarks, celebrities, cities, sports teams, buildings, geographical features, movies, celestial objects, works of art and more — and instantly get information that’s relevant to your query. “This is a critical first step towards building the next generation of search, which taps into the collective intelligence of the web and understands the world a bit more like people do,” the Google blog says. Language can be ambiguous — do you mean Taj Mahal the monument, or Taj Mahal the musician? Now Google understands the difference, and can narrow your search results just to the one you mean — just click on one of the links to see that particular slice of results. This is one way the Knowledge Graph makes Google Search more intelligent — your results are more relevant because we understand these entities, and the nuances in their meaning, the way you do. With the Knowledge Graph, Google can better understand your query, so it can summarize relevant content around that topic, including key facts you’re likely to need for that particular thing. For example, if you’re looking for Marie Curie, you’ll see when she was born and died, but you’ll also get details on her education and scientific discoveries. How do we know which facts are most likely to be needed for each item? For that, we go back to our users and study in aggregate what they’ve been asking Google about each item. For example, people are interested in knowing what books Charles Dickens wrote, whereas they’re less interested in what books Frank Lloyd Wright wrote, and more in what buildings he designed. The Knowledge Graph also helps us understand the relationships between things. Marie Curie is a person in the Knowledge Graph, and she had two children, one of whom also won a Nobel Prize, as well as a husband, Pierre Curie, who claimed a third Nobel Prize for the family. All of these are linked in our graph. It’s not just a catalog of objects; it also models all these inter-relationships. It’s the intelligence between these different entities that’s the key. The Knowledge Graph can help you make some unexpected discoveries. You might learn a new fact or new connection that prompts a whole new line of inquiry. 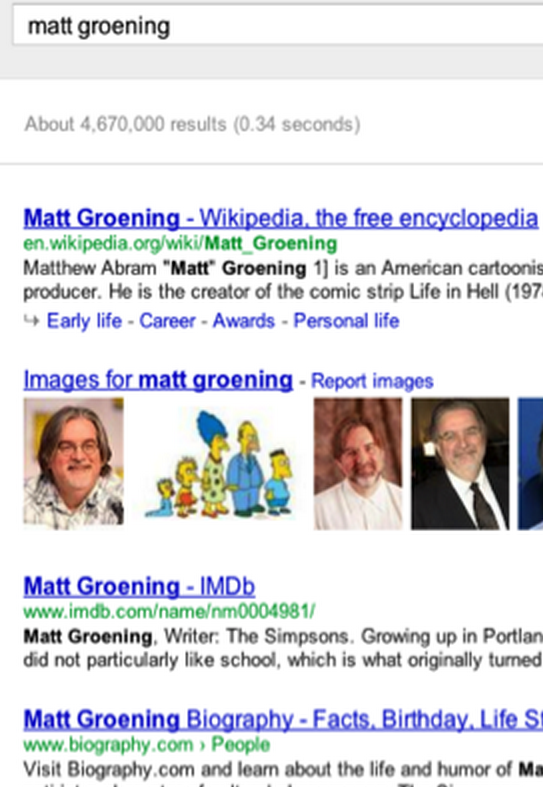 Do you know where Matt Groening, the creator of the Simpsons, got the idea for Homer, Marge and Lisa’s names? It’s a bit of a surprise. “We’ve always believed that the perfect search engine should understand exactly what you mean and give you back exactly what you want,” says the blog. “And we can now sometimes help answer your next question before you’ve asked it, because the facts we show are informed by what other people have searched for. “For example, the information we show for Tom Cruise answers 37 percent of next queries that people ask about him. In fact, some of the most serendipitous discoveries I’ve made using the Knowledge Graph are through the magical ‘People also search for’ feature. One of my favorite books is The White Tiger, the debut novel by Aravind Adiga, which won the prestigious Man Booker Prize. Using the Knowledge Graph, I discovered three other books that had won the same prize and one that won the Pulitzer. I can tell you, this suggestion was spot on! Google has begun to gradually roll out the Knowledge Graph to U.S. English users. It’s also going to be available on smartphones and tablets.